Special Edition DJ Speaker Stand Included! Built-in Rechargeable Battery - Take Your Music Everywhere You Go! Guitar Amp - Plug any Electric Guitar and You're Ready to Rock! 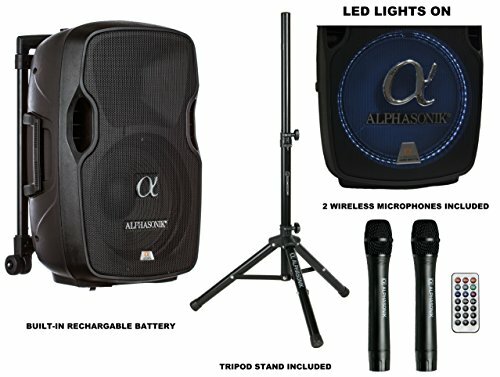 Take your music anywhere with Alphasonik's compact and portable high output DJ speaker system with a built-in rechargeable battery. Perfect for indoor, outdoor, parties, parks or speech events. High capacity battery provides for long hours of operation with a single charge. Quick battery charging capability enables you to be cord free for hours. Enjoy high output music without sacrificing quality sound. High power speaker components reproduce clear vocals and crisp highs. Play your music wirelessly from any Bluetooth enabled device such as iPhone, Android, iPad or others. Enjoy your digital music for hours by plugging an SD Card or USB media drive and play your MP3's. Compatible with analog devices with 3.5mm output jack and play your audio via the Aux input. Play live music or content with the built-in FM Radio. Easily operate the system with the bright and clear LCD screen and the on-screen display (OSD). Create beautiful memories by performing karaoke duets with family and friends. Two high quality wireless vocal microphones are included. Built-in dual antennas ensure a solid wireless audio transmission for each microphone. Never misplace your microphones again by placing them on the included holders. Simply insert the holders into each cavity on the back of the enclosure and secure you microphones in place. Elevate the sound with the included tripod mounting stand. Add vocal effects with the built-in Echo function. Use the VCV feature to clearly convey your messages or announcements. VCV automatically reduces the music sound level when you speak into the microphone(s). The music sound level rises back when you stop using the microphone(s). Impress your audience with the built-in LED strobe light that flickers with the beat of your music. Have the freedom to transport the DJ speaker anywhere with the built-in retractable handle and smooth rolling wheels. Fine tune the system with the precise soft grip knobs that allow you to adjust the levels to the right amount of output. Have more control functionality with the included IR wireless remote. Use various types of audio connections such as AUX, RCA and 1/4" to play your music.